Justin Jordan's New Guardians has been a largely charming sci-fi romp. If for instance Green Lantern Corps did not end its New 52 run as strongly as it started, New Guardians has been as good if not better than the Tony Bedard run that preceded it, again with Jordan's heavy planet-of-the-week sci-fi aesthetic. We get another of those in Green Lantern: New Guardians Vol. 6: Storming the Gates's closing three issues, after the "Godhead" crossover, and it's a satisfying (if slightly chaotic) end to the series. Jordan also resolves this book's problematic romantic triangle in an equally satisfactory form. In the continuing saga of the individual "Godhead" collections, New Guardians reads just fine on its own, following White Lantern Kyle Rayner and Star Sapphire Carol Ferris to the New Gods' New Genesis. The story intersects with Green Lantern Corps, especially, but the focus remains on Kyle and Carol throughout (on the other hand, reading "Godhead" straight through, the intersections did successfully keep most issues from feeling too much of a single series). The only drawback, as has been true of a variety of the "Godhead" collections, is the absence of the concluding Green Lantern annual (only collected in Godhead and Green Lantern proper) -- but this is especially problematic in New Guardians, since Kyle and his White Lantern and Life Equation abilities play a fairly significant role in the end. "Godhead" ends with Hal Jordan giving Kyle his blessing for Kyle's relationship with Carol, the nadir of an overall troublesome storyline in which Carol acts as romantic football between the male Lanterns. Fortunately Justin Jordan kicks off the final three issues by bringing the relationship to a close, and indeed having Carol be the one to end it. I had been concerned that Jordan would either have Carol authentically love Kyle, which seems wholly unbelievable after she was just engaged to Hal, or otherwise have Carol being forced into love with Kyle by the Star Sapphires (not unlike Fatality and John Stewart in Corps). Instead, we find Carol admitting to Kyle as a rebound relationship after Hal, and that she perhaps chose to rebound with Kyle in order to continue her love-powered superheroics. That's maybe a little selfish, sure, but Jordan again writes Carol and Kyle's interactions so well that neither character comes off badly or takes it too hard. And it's better, to be sure, that Jordan had Carol intentionally entering into a relationship that she knew to be nonsensical than that she actually felt for Kyle or was under some mind control. The three-part finale is slightly overlong, stretching out a fight between Kyle and his doppelganger Oblivion to the point of repetitiveness. Penciller Diogenes Neves shares duties with some fill-in arts, and the quality ebbs and flows with Kyle and company looking sometimes too distorted. Oblivion resembles at times Spider-Man's Venom, complete with fangs and tongue, and he's sillier than scary until he becomes truly monstrous in the end. The saving grace is again Jordan's writing of Kyle and the supporting characters, and here perhaps especially the supporting characters. Carol is a favorite, and Jordan also brings in Blue Lantern Saint Walker, and the boisterous warrior Exeter who's had precious little time in this book. Further, Jordan's solution for Kyle's defeat of Oblivion -- creating a White Lantern corps -- is both surprising and perfectly appropriate at the same time. This is a great point on which to end, but I wouldn't have minded a little more or for Jordan to return to writing Kyle some time; I'd be curious to see what new challenges face Kyle as the leader of a Corps, especially when he started once upon a time as the universe's sole lone Green Lantern. 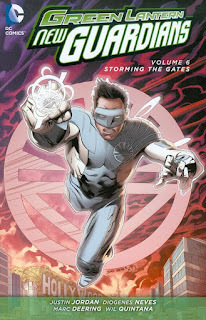 I have liked Justin Jordan's New Guardians run even as aspects have bothered me, but in Green Lantern: New Guardians Vol. 6: Storming the Gates, Jordan both reconciles it all and brings his run to a fulfilling close. I know Kyle Rayner continues into Omega Men with less than stellar fortunes, but again I'm eager for someone to take up the story of Kyle as a Corps leader. Even better that Jordan sends Carol off into space as herself a proto-White Lantern. I know full well that "Carol Corps" is already taken, but with DC's renewed push for diversity, I'd be happy to see another writer take up Carol's adventures as well, a character surely as worthy of spotlight as Poison Ivy and others.